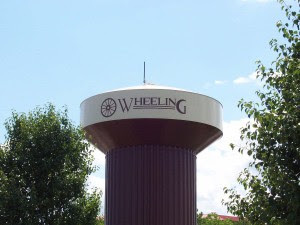 The village of Wheeling is located approximately 30 miles northwest of the Chicago "Loop" in suburban Cook county. The population was 34,496 at the 2000 census, and estimated to be 36,641 as of 2005. The village has a total area of 8.4 square miles. The village is bordered by Buffalo Grove to the north, Northbrook to the east, Prospect Heights to the south and Arlington Heights to the west. O'Hare International Airport is approximately 12 miles from the Village. According to data from the Northern Illinois MLS there were 82 sales of single family homes in 2007, down from 149 in 2006. The average sales price was $299,136.00, this was a decrease from $323,038.00 in 2006. Marketing times were an average of 127 days on the market, up over the 2006 average of 62 days. As of February 21, 2008 there are 89 active listings of single family detached homes in the MLS. At the 2007 level of absorption this is 11.61 months of unsold available inventory. A 3-4 months supply of inventory is considered "in balance", this level is an oversupply. To recap 2007 for detached homes, sales volume was down -38.25%, average sales prices are down -7.39% and the days on the market were up +104.83%. This market is oversupplied and the 89 active listings have already been on the market an average of 183 days. The condo/townhouse market had 279 sales, down from the 403 properties that sold in 2006. Sales prices saw a decrease with the average 2007 sales price at $215,430.00, compared to $218,610.00 in 2006. Marketing times were an average of 134 days on the market, an increase from the 2006 average of 82 days. There are 253 active listings of attached homes in the MLS. Based on the 2007 level of absorption of 23.25 sales per month, this is 10.88 months of unsold inventory. The condo/townhouse market is oversupplied, sales volume was down -30.76%, average sales price decreased -1.45%, and the days on the market increased +63.41%. The 253 active MLS listings have already been on the market an average of 174 days.